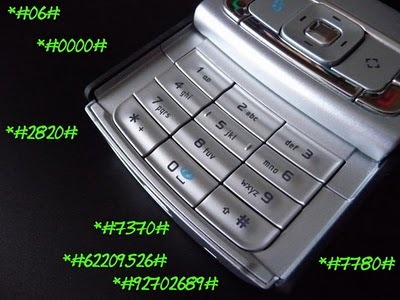 Here is the complete list of Nokia Mobiles’ Secret Codes. You can know very informative and interesting information about your Nokia mobile phone by using these useful Nokia Built-in codes.Enter a code from your Nokia Mobile’s keypad and get the results. Note: These may not work properly on your mobile phone. Or these codes may damage your mobile phone. So, try these codes on your own risk. *#06# - Display the IMEI (International Mobile Equipment Identity). *#67705646# - This will clear the LCD display(operator logo). *#0000# - To view software version. *#2820# - Bluetooth device address. *#3925538# - Delete's the contents and code of wallet. #pw+1234567890+1# - Shows if sim have restrictions. *#7328748263373738# - Resets security code.